We were honored to have not one but two speaking sessions accepted for RSA, which is remarkable for a company of our size and stage. 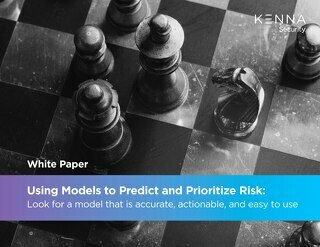 The first was presented by Kenna’s chief data scientist, Michael Roytman, and the other by our co-founder Ed Bellis and our head of research, Jonathan Cran. More than 200 people attended Michael’s session, Predicting Exploitability—Forecasts for Vulnerability Management which focused on our newly released Exploit Prediction feature, and how by leveraging open source data and a clever machine learning model we can now predict which vulnerabilities attackers are likely to write exploits for with greater than 90 percent accuracy. In Recon for the Defender: You Know Nothing (About Your Assets), Ed and JCran discussed how while understanding what you own is a step one in securing your assets, this simple concept still escapes the grasp of most. 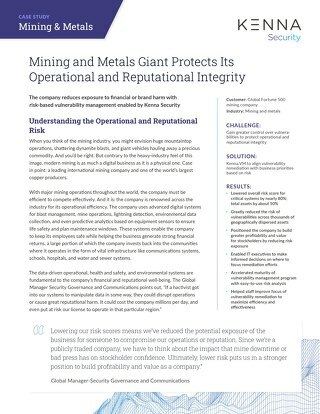 They went on to illuminate the plethora of APIs and publicly available data that can give security teams a jumpstart on identifying high-risk assets. We hosted an invitational CISO roundtable breakfast moderated by Jim Routh, the CISO of Aetna, as well as a Happy Hour for over 65 customers, prospects, partners and friends. Kenna was a Silver Sponsor of the Information Systems Security Association (ISSA) Security BSides SF2018 a two day long, steampunk-themed event with Security BSides, a community-driven framework for building events for and by information security community members. Our CEO Karim Toubba spoke at AGC’s Security Conference, which brought together senior industry executives, private equity and venture capital partners, and other institutional investors and business development executives representing a diverse array of technology enterprises. 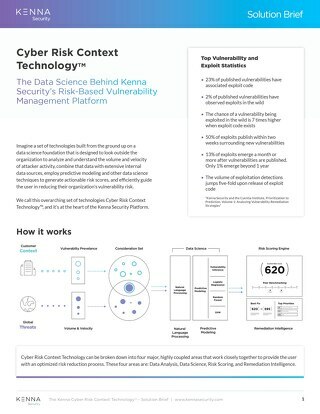 Our CEO Karim and co-founder Ed met with Kenna’s Customer Advisory Board (CAB) to discuss ways our customers are effectively leveraging the Kenna Security Platform to operationalize vulnerability risk reporting, prioritization and remediation within their company. Kenna was named one of the Bay Area’s “Best Places to Work,” earning us a great write up by the San Francisco Business Times who commented on our amazing company culture. 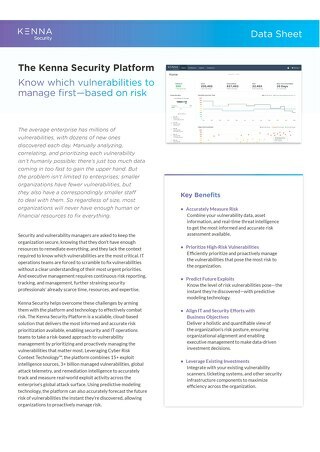 On the product side, Cyber Defense Magazine honored The Kenna Security Platform with several 2018 Infosec Awards including the Best Product for Risk Management, Editor’s Choice for Cyber Risk Management, and Cutting Edge Award for Vulnerability Management. And our co-founder and CTO Ed Bellis was named CTO of the Year in the Info Security Product Guide’s Global Excellence Awards. Ed also received an award in the Security Debate category, and The Kenna Security Platform received awards in Vulnerability Assessment, Remediation and Management, SaaS/Cloud Solutions Risk Management and Cyber Security Vendor Achievement of the Year categories. 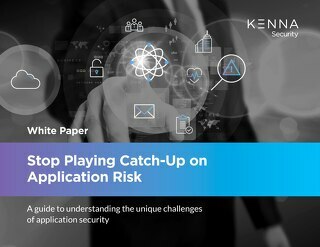 It’s been a huge year so far for Kenna, and RSA was a major validation of our approach of extending security beyond the traditional prevent-detect-eradicate model to one that is both proactive and predictive. Just as RSA brings security, IT and DevOps teams from across the country together, Kenna aligns these same teams within the enterprise around measured risk, prioritized remediation, and making a substantive difference to prevent cyber-attacks against their organizations. Lot’s more to come and looking forward to next year! 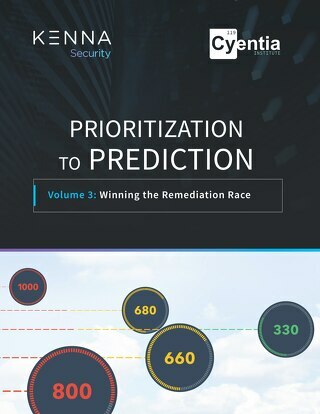 The post Some Highlights From RSA 2018 appeared first on Kenna Security.